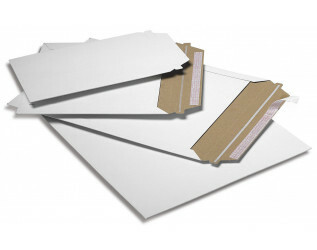 Our White All Board Envelopes are made from a rigid white-lined board to provide an impact resistant product. These heavy duty white board envelopes have a peel and seal flap to provide document security, product protection, and are tamper evident. These envelopes are available in 8 sizes, and are also available in 6 additional colours. Special attention has been given to the larger C2 (625x444) size by increasing the thickness to 600microns to compensate for the size.